Many of us find reasons to get out there and train. For some, it is all about health and fitness goals. Others run simply because they love it. (I think those are the truly crazy people.) I run for a combination of reasons, but this last weekend all of those reasons were pushed aside as I had a chance to run for the kids of St. Jude Children’s Research Hospital at the Memphis Marathon. I can’t begin to tell you the flood of emotions that hit as I sat at the Friday night Pasta Party and heard from the families that were directly impacted by the work and generosity of St. Jude. If I had any doubts about running, those faded away as I saw the faces of boys and girls who were given a second chance at life. I am so thankful for my sponsors that helped me get to my fundraising goal. While I can’t afford to repeat many marathons due to financial and physical restraints, here is a marathon that I would love to tackle again. Three things helped me make it through Saturday’s 26.2. One, I wore my Superman suit. I know… Crazy. But here’s the best part, everyone cheers for Superman. I had other runners, kids, aid workers, spectators, and random strangers yelling, “Go, Superman!” If you haven’t worn a costume to a race, try it. You will get all types of emotional support from those around you. The second thing that helped was a Marathon Maniac that I met at the White River Marathon for Kenya in Cotter, Arkansas. Brent encouraged me throughout the race as we ran together. 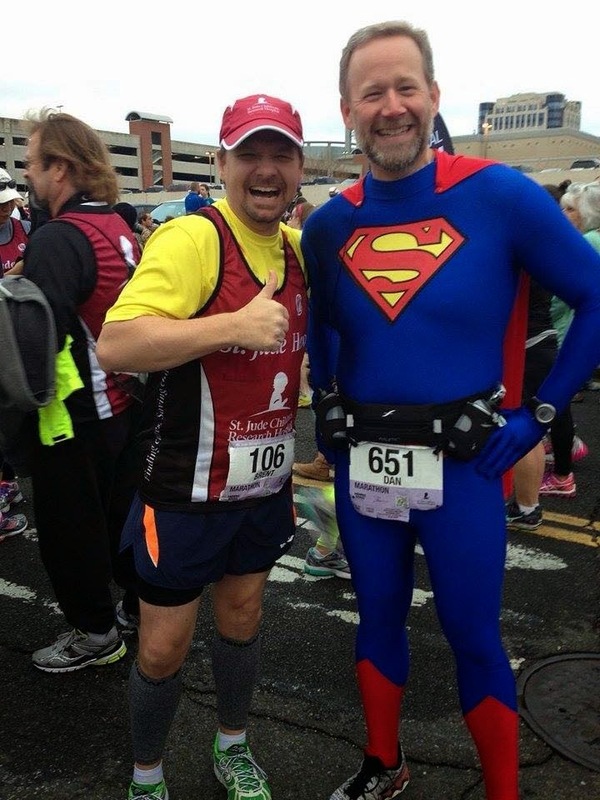 A shared faith and an encouraging spirit made my marathon journey an enjoyable one. The third thing that keep me going was the faces of those kids. I knew that I couldn’t let down the real heroes of this story, the Kids of St. Jude. Let me encourage you to find a reason to run beyond yourself. If you run for just yourself, you will stop after your goals have been met. However, if you run for St. Jude, Lifeword Media Ministries, Soaring Wings Ranch, or another local charity, you will keep running even after your list has been checked off. To be healthy, we need to take care of ourselves. We need to invest in our emotional, spiritual, physical, fiscal, and intellectual health. However, we must always remember that it isn’t all about us. God has placed us in this world to be his agents of change and love. Let’s embrace that calling and let it impact every aspect of our lives. Me and Brent before 26.2 at the St. Jude Memphis Marathon.